3 days!!! I am not good with the recaps of training miles, pace, etc.. But I do have High Fives for a few AWESOME Products which helped me during my training. Patented for Targeted Relief. Treat all aspects of the knee and leg with this versatile thermal compress wrap. 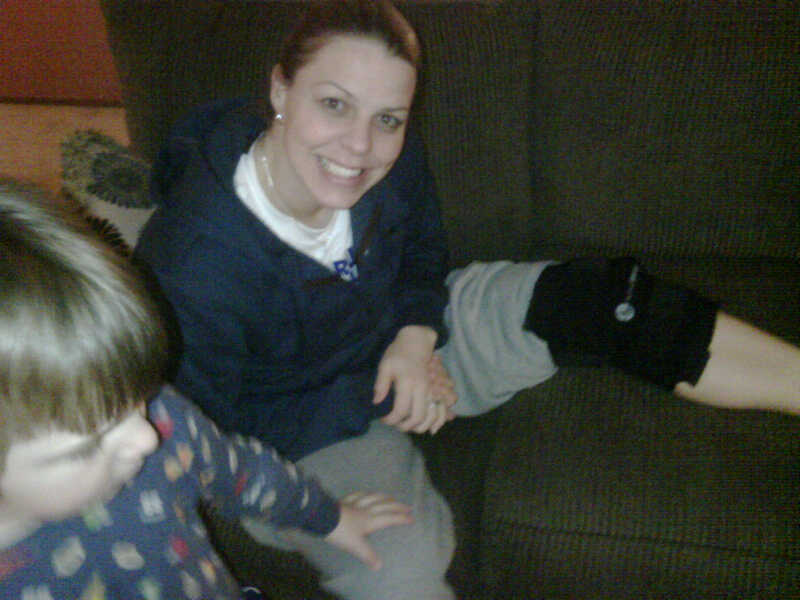 The ActiveWrap knee system includes 2 large reusable heat & ice packs and a durable plush-prene™ compress wrap. Complete with generous 3" wide plush compression straps that can be spiraled around the support to provide focused compression and fastening. Designed for injury specific adjustability and freedom of movement. Full One Year Warranty. Washable and built to last. The ActiveWrap Heat & Ice wrap is the absolute finest heat and ice wrap on the market today. They kindly sent me a Knee wrap to TEST. I am not a fan of ice baths but I do need to take care of my Left Knee (2 surgeries in college). This wrap is AWESOME!! What an upgrade from the bag of peas. I love that I can tighten then straps and feel the cold hiting my target sore spots. ActiveWrap HERE also carry products for Foot & Ankle, Back, Wrist, Shoulder and Elbow. I have not used the pack for heat yet but I am sure I will love that too. Tall Mom Tested Battle Approved. I wore these socks on a 20 miler and 23 miler and my legs felt great!! I had some calf cramping and the tightness of the compression gave me a little extra stability and comfort. The cushion in the toe and heel is nice for longer runs. These socks are great for recovery but also fantastic for on the run. With fun colors like Pink, Black and Green you can have some fun. I put these in the wash but did not dry them and have help up great!! 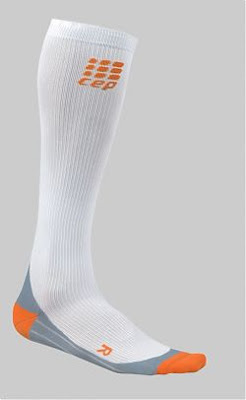 CEP also carries compression sleeves if you cant give up that favorite pair of socks, but want some compression. My only complaint is the Price, there are other products on the market with a lower price point. Tall Mom Tested Battle Approved. Sof Sole HERE sent me insoles to test but I am waiting until after Boston. But I have to tell you about these socks. I am in LOVE!! These socks are soft, breathable, light weight and just high enough to land above my shoe. The best part is I feel I could wear the socks during any season, which makes them an asset to my running wardrobe. Tall Mom Tested Battle Approved. Sorry to those who read my Reviews and Giveaway page HERE...this is a repeat.. Since I already packed this image will have to do.. If you see me please wave, yell, smile and take my picture :) I wont have family along the course, so I will adopt you ALL!! **Special Thanks to Shannon at Moeben for sending a second pair of sleeves when the first pair did not fit. The sleeves are very symbolic for me (Daisy for my Mom and Blue dot for my Dad) and I feel blessed to wear them! Special Thanks to Morgan HERE for sending me the list below to copy :) we have some FUN FUN Blogger meets ups on the schedule thanks to Morgan and others.. Sorry took too long to link everyone, copy address and past in your browser to go give a High Five! Phew!!! So all of you out there not in Boston on 4/18 plan a sick day, it will be worth it!! I will try to Blog from the Airport and along the way but no promises, I don't plan on sitting in front of the Computer. My trip is short.. I leave at 6am on Saturday, arrive 6pm-ish. Sunday is 5K, meet-ups, Expo and Packet Pickup. Monday is Marathon, Post Race Milkshake, and sight seeing, depending on how I feel post race. Tuesday fly out mid-day. Not much time for computer. But I will have 2 AWESOME Giveaways popping up the next 2 days. Don't say I never gave you anything.. I plan on reading all of your good vibe comments the night before the race. Quotes, inspirational messages, and High Fives are much appreciated!! Keep busy by Entering the Gone for a Run Giveaway HERE ends 4/21!! With 2 more Giveaways coming this weekend!! high five to you!!! i wish you the best race and experience. i can't wait to read all about after you rock boston! have a great trip, soak it all in, enjoy every moment - you deserve this!!! Sending you and all the other runners good vibes for Monday. Enjoy YOUR day! You earned it. Can not wait to hear everyone's race recaps!! (I usually have off on Mondays so I was bummed to see I have to work...boo...I'll still cyber stalk you all). Wish I could go so I could be your personal photog. So excited for Monday. It's a non-workday for me so u know what I'll be doing! High Fives for YOU!!!!! Safe travels and fun times only for you this weekend! And of course good luck Monday! Ohmigosh, LOOK AT YOU ALL! My hand hurts from all the virtual high fives!!! The weather guy said there is going to be a tailwind coming into the city on Monday. Woo-hoo! you are going to do great! Good luck! I'll be out spectating on Monday! Have a fun trip! You are TOTALLY going to rock the marathon. Can't wait to hear all about it when you get back. Enjoy your 26.2 mile victory lap! I already set up the DVR (channel 115 where I live) to watch the fun. its okay...I didn't really want a high five anyway...totally just kidding so excited for everything and everyone this weekend! That list is SOOO awesome!! Congrats to everyone!! Mel, good luck on Monday and kick some serious booty. Finish strong! Enjoy every minute. I love the list both of runners AND spectators/volunteers. Both serve their purpose in getting the athletes to the finish line! It has been so much fun following your journey. You are going to do great! Wish I had remembered to take the day off before it was too late, it's soooo much fun watching the marathon! Sending lots of luck and high fives your way!!!! I feel so honored to have traveled with you on your adventure to Boston. I am so excited for you all the runners! Good Luck, You will do amazing! Good Luck Mel! Boston is just an amazing experience! Soak it all in and just RUN!!!!!!!! High Five! You are going to rock Boston. You're going to ROCK it! Good luck this weekend! You're so going to rock it! You are going to do great on Monday! Mel I know you will do awesome at Boston!Thank you for running so many long runs with me, you truely are inspiring! Have a great time in Boston and rock the race! So excited for you this morning! I got the email alert that you finished. Be proud of the effort you put into this.